Iron, the Essential Mineral for Pregnancy! Did you know that the iron requirement almost doubles during pregnancy? What makes iron so important in pregnancy and what is its role? Read on to know..
Iron is an important component of hemoglobin that carries oxygen to all the body parts and to the placenta. This enables the formation of red blood cells in both the mother and the fetus. It is very important to maintain good iron stores throughout pregnancy and especially in the second and third trimester as the fetus starts storing the mineral for the first few months after birth. Iron deficiency causes anemia, which means that red blood cells are unable to carry enough oxygen to all the body parts making the mother feel tired and fatigued. Anemia also reduces the immunity of the mother making her fall prey to common bacterial and viral infections. • Legumes like chick peas, rajma, dried beans etc. You can improve the iron absorption from vegetarian sources by including foods rich in vitamin C like berries, lemon, oranges, capsicum, broccoli, sprouts, cabbage, cauliflower and tomatoes. • Choose cereals, legumes, and green leafy vegetable preparations regularly. Hemoglobin levels are monitored throughout pregnancy to check for iron deficiency. And if necessary, you doctor will prescribe iron supplements for a particular period. What should be avoided while taking iron supplements? Beverages like tea and coffee when taken along with meals reduce iron absorption. If you are anemic and taking iron supplements, it is better to drink tea or coffee in between meals rather than along with the meal. Iron and calcium supplements when taken together compete for absorption. So it is better to stop one supplement while taking the other, for better absorption of a single nutrient. 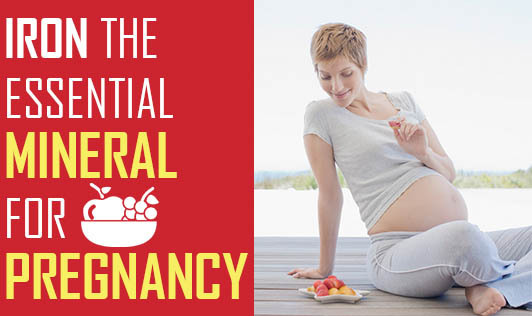 To know more about importance of iron during pregnancy, contact your nutritionist.